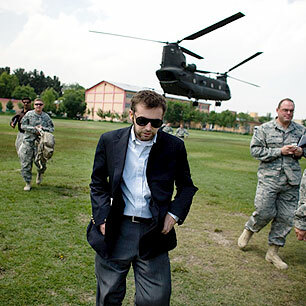 With one incredible story, Michael Hastings has etched a place in the annals of journalism. Hastings, of course, is the reporter who wrote the Rolling Stone magazine story — not even on the newsstands yet — that brought down Gen. Stanley McChrystal, the Afghanistan war commander whom President Obama fired Wednesday. What Hastings managed to pull off is an amazing journalistic feat. He gained ready access to McChrystal and his team of advisers for a month, after intending to spend just two days with him. During that time, Hastings played the wallflower, like any smart reporter would, while the general and his aides blazed away verbally at Obama, Vice President Joe Biden, national security adviser James Jones and other civilian leaders. I had never heard of Michael Hastings before this week. Turns out he is a former Baghdad correspondent for Newsweek and a blogger for True/Slant on Iraq and Afghanistan. In 2008, he had a book published — “I Lost My Love in Baghdad” — about the death of his girlfriend, who had joined him in Iraq and was killed in a 2007 ambush. If Hastings, who is about 30, wasn’t widely know before, he has certainly catapulted himself into the public eye now. When I read this article, I had two primary thoughts: First, I would loved to have been in Hastings’ shoes. And second, how in the world could McChrystal have been so stupid? Interestingly, the damage was done early in the story. A New York Times story says in effect that Obama had seen enough after reading the first few paragraphs. Q: What was General McChrystal’s response when his top aides were more or less trash-talking the administration? For example, when an aide called Vice President Biden, “Bite Me” right next to McChrystal, did the general laugh? Was he in on the game? A: Oh yeah, no, he laughed, certainly. You know, this is their humor and I think the humor reflects something more. I think reflects a disdain for the civilian leadership in a way. Q: Did they know that you were there? Did they notice you scribbling notes, Michael? A: Oh, yeah. I had my tape recorder and notepad out most of the time. So it was always sort of unclear to me, you know, what was their motivation of allowing me in and all of this access. I think there’s a number of factors that were involved, but I think an important one is that they had had a number of very flattering profiles done on them over the past year, and so they were accustomed to sort of allowing access and having reporters play ball so they could give them more access later. Well, that’s not really a game I’m interested in playing. McChrystal is the last of many big shots to succumb to hubris, and, thank God, reporters have been there many times to take the snapshot while those big shots have exposed themselves.